I'm not really sure what I'd been expecting, but it wasn't anything so dark as A Touch Mortal turned out to be! Not that that is a bad thing, it was just slightly unexpected. Angel YA used to be a hit or miss for me, with more misses than hits to be honest. It just gets preachy easily, you know? But A Touch Mortal falls squarly in the middle with things I very much liked and things I had issues with. I had a hard time connecting to Eden. Her emotions were all over the place, she went from suicidal to blissfully happy and back, there wasn't really anything in between. I did admire her strength in the later part of the novel though, I hadn't thought her capable of it when I first met her. She's a leader, and though she doesn't always make the right choices and is a little careless with her safety, I do like her spirit. I think part of the problem was that I had a hard time getting into the lovestory and since it's pretty much the catalyst for what happens in the book, which made it a little bit more difficult to fully get into the story. I actually liked Gabriel more than both of the love interests: Az and Adam, too bad Eden could go guy-spotting with him. I really liked the angel-lore with wings only being given when an angel is 'on probation' so to speak, with them having a different meaning than just being beautiful and actually being a punishment. I would have liked to find out more about what exactly makes a person a Sider and why they have Touch they need to spread and everything. There has to be a reason right? I hope things will get somewhat clearer in the next two books. 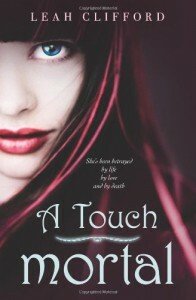 Far darker than most YA, A Touch Mortal is an interesting take on angel-lore and while I had to work a little harder to get into the story, I'm also excited to see what will happen next for Eden and her friends and see if I will fall for Luke as well!